Tap bar menu is used instead of taps and menus in android. It covers only small space of app because is only one tab or button is visible by default. If users click it expand to more vertically or horizontally with material design animation effect. It is better to use at the bottom of screen instead of bottom tab layout or you can use instead of dropdown/popup menu or option menu. In this tutorial, you will learn to implement tap bar menu in your android application or game with animation effect. 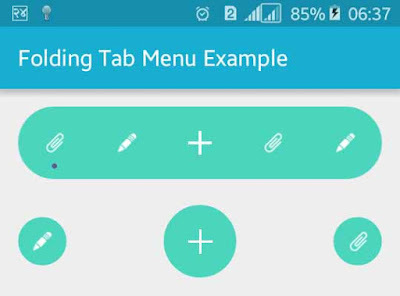 Following are the simple steps to implement tap bar menu in android. First you have to add compile 'com.github.tosslife:foldingtabbar:1.0.0' dependencies in your app build.gradle file. Build.gradle file will looks like below. After adding gradle dependencies open your app XML layout file and then add com.srx.widget.TabBarView inside any layouts. Your XML layout file will looks like below. In java activity file we control all things like we add menu icons, animation effect and also control onClick event. Following is the complete code of java activity file; you can paste it in your java activity file. Now run your Animated Android Tap Bar Menu Example application and click on the plus button you will see other more option with animation effect. You can use button icon according to your needs and control on click event.